Location: Bargy, County Wexford, Ireland. Notes: Bargy Castle is a Norman fortress near the village of Tomhaggard in the Barony of Bargy, County Wexford, Ireland, some 12 km south-west of Wexford town. The name Bargy derives from Ui Bhairrche, the name of a local tribe. The building is a square keep to which two wings have been added at right angles during the fifteenth and seventeenth centuries. The keep itself is in good condition, having been renovated several times. 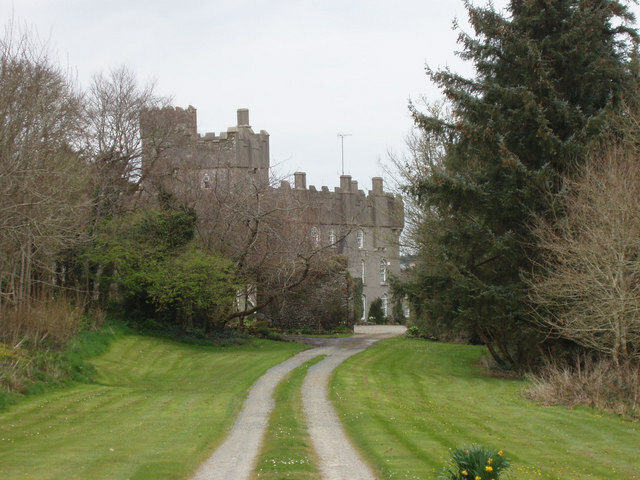 From the 15th century the castle was occupied by the Rossiter family until 1667, when it was confiscated by Cromwell in response to Rossiter's part in the defence of Wexford. It was then granted to William Ivory, who sold it to the Harvey family. It came down to Beauchamp Bagenal Harvey, the commander of the Wexford insurgents in the Wexford Rebellion of 1798. After the suppression of the uprising, and Harvey's execution on Wexford bridge, the castle was again confiscated and used as a barracks until 1808, after which it was handed back to James Harvey, Bagenal's brother. He, however, lived in London and allowed the castle to deteriorate, but after his death it passed to Councillor John Harvey, who restored it. He died in 1880 and is entombed in a mausoleum in front of the hall door. The castle was afterwards let to a Mr Leared, who re-roofed and improved it. The last Harvey family member to own this castle was James Harvey, and his wife Henrietta. Their daughter, Antoinette Harvey, was born in the castle in 1945. It was bought in 1960 by General Sir Eric de Burgh, a former Chief of the General staff, Indian Army (and the maternal grandfather of musician and songwriter Chris de Burgh) and occupied by him and Charles and Maeve Davison, Chris de Burgh's parents. Together they converted it into a private hotel.